The first thing to do is definitely break out a column like this into multiple columns in the query editor. You should have one column as the date and then another with the km amount. 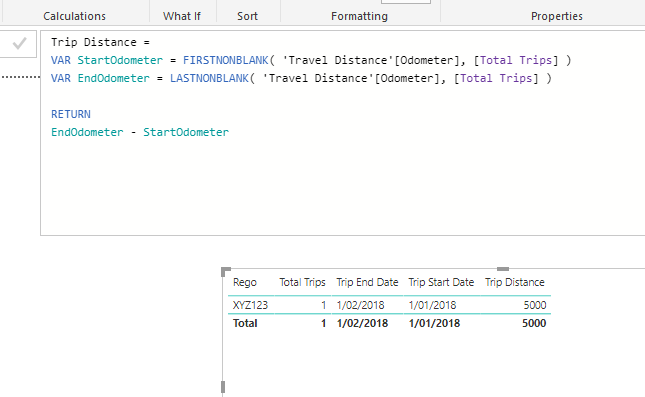 Having data setup like this is almost useless really in Power BI, but that is what the query editor is perfect for. So you just need to split the columns basically in the correct place. Then you calculation is a piece of cake. Just one minus the other I would say. See how you go with these ideas. I did not explain myself very well. This is the way the records are currently in the table. I am struggling to create a measure that can be used to calculate distance travelled over the time period filtered by Vehicle rego. The first thing I think you should do here is create an index column. This way if the same registration pops up then you have a column that can refer to the closest input. But you might not need this if you just have the Rego mentioned once. I’ve attached the mock up I created. Thanks for your example and help. Due to work committments I have only had a chance recently to get back to this issue. I cannot get your measures to work correctly with my data model. It is showing me the total distance travelled at the bottom of the table but not individual trip distance. I have attached my test report and data. Is it possible to be more specific around the exact issue, laying out the problem formula etc. As much assistance as possible to target in on the exact problem is what I’m looking for. Based on the information you’ve given most recently and from looking at the model quickly, I’m unsure as to what I should be looking at the also what formula I’m meant to help with. I hope @sam.mckay doesn’t mind, but I took a stab at this. I did a lot of the heavy lifting in Power Query, so please be sure to take a look at those in the attached. My goal was to get current row’s transaction odometer reading to “move down” one row as that would be that rows starting odometer reading. But first had to be sure to group by Reg Number (don’t want overlapping car info) and then want to be sure the dates are sorted in an ascending manner. You can do with creating an Index column starting 1 and another one starting from 0 and merging the table with itself ( left outer join using those index columns created). I’m sure there are probably somethings that wont work 100%, but this should hopefully be of some help!